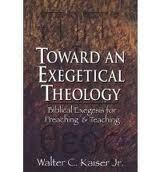 Kaiser, Walter C. Toward an Exegetical Theology: Biblical Exegesis for Preaching and Teaching. Grand Rapids, MI: Baker Book House, 1981. Walter C. Kaiser Jr. does a good job in surveying the current crisis in exegetical theology and the definition and the history of exegesis in part one of his book (Alexandrian [implemented heavy allegory] and Antiochian School [implemented one sense or one meaning of a text]). In the section concerning the current crises, Kaiser addresses the hermeneutical issues (science of interpretation). The hermeneutical issue at hand can be found in Kaiser’s question, “Is the meaning of a text to be defined solely in terms of the verbal meaning of that text as those words were used by the Scriptural author? Or should the meaning of a text be partly understood in terms of ‘what it now means to me,’ the reader and interpreter (24)?” To Kaiser, the art and science of interpretation (hermeneutics) is critical because it will determine whether one will land at the right interpretation. And since we want to hear from God, getting the right interpretation should be our aim. In section one, as stated earlier, Kaiser ventures into the definition and history of exegesis. Exegesis is a term derived from a transliteration of a Greek word that means “narration,” or “explanation” (43). Often when the term exegesis is brought to surface, we think of mainly Grammatical-Historical Hermeneutics, but according to Kaiser, exegesis is more than just Grammatical-Historical Hermeneutics, or the master of Hebrew, Aramiac, and Greek, syntax, phrases, clauses, sentences, but also includes the syntactical-theological method too. The syntactical-theological method consists mainly of a contextual, syntactical, verbal, and theological analysis. In light of all those features, one major component Kaiser brings to the limelight is the importance of antecedent theology; as well as finding the proposition or sentence of each paragraph. In regards to antecedent theology, Kaiser believes that newer revelation should be based upon older revelation rather than newer revelation being inoculated into older revelation. To Kaiser, older revelation stands on its own feet and does not need newer revelation to shed light on it. Without doing violence to the OT standing in its own feet, I do believe that “progressive revelation” is very helpful and does shed some light on certain areas of Scripture such as the Gospel, resurrection of the saints, etc. without doing violence to single meaning. Progressive revelation is helpful because it completes the entire enterprise for topics such as the Gospel, eschatology, etc. I really admired Kaiser’s tone in this book. He is very passionate about the importance being biblical preachers and teachers; and getting the right meaning of the text across. Another characteristic about Kaiser that I like is his commitment to hard work. He pursues excellence in sermon preparation and does not like to cut corners by simply ignoring the Grammatico-Historical Method. He takes it seriously. His book convicted me and I pray that it will sanctify me in my sermon preparation when I am tempted to be lazy. The weaknesses are minimal. But in terms of weaknesses, the book at times, can be a little dry. The myriad of names mentioned throughout the book got me lost in my reading. At some occasions, it took me a while to figure out who believed what because the names kept jumping one from place to another. In addition, some of the foreign languages increased the technicality of the book—this made the reading at times difficult to read. Because the book gets technical in some areas, I think the reading would be clearer if Kaiser used more illustrations and examples to explain his conceptions of biblical exegesis. Another “possible” weakness; and this is up to debate, is the continual stress that one cannot impart later revelation into an older revelation. I totally agree with Kaiser on this point. I agree that the Old Testament stands in its own feet and does not need the New Testament to reinterpret the Old Testament or replace the Old Testament. However, some argue that there maybe “exceptions” where the NT writer can go beyond the grammatical-historical sense in his use of an OT passage without violating the single meaning (Robert L. Thomas, “The New Testament Use of the Old Testament, 1). That gets into the discussion of “inspired sensus plenior application” (ISPA) which treads into an area of advanced hermeneutics. I can not discuss ISPA in detail because I will need to study ISPA more before I make an official stance. A good book that I would like to finish reading that covers ISPA is entitled, “Evangelical Hermeneutics” by Dr. Robert L. Thomas. I will need to revisit this topic in the future. Below are lists of quotes that were insightful and had an impact on me. I pray that I go back to these quotes as a reference. For Luther, ‘The Holy Ghost is the all simplest writer that is in heaven or earth; therefore his words can have no more than one simplest sense, which we call the scriptural or literal meaning” (60-61). Calvin was not one whit softer on the allegorizers. Commenting on Galatians 4:21-26, he blasted every such introduction and foisting of numerous meanings onto Scripture as ‘a contrivance of Satan.’ And in his commentary on Romans, he inscribed a dedicatory letter to a friend in which he said: ‘Since it is almost his [the interpreter’s] only task to unfold the mind of the writer whom he has undertaken to expound, he misses his mark, or at least strays outside his limits, by the extent to which he leads his readers away from the meaning of his author….It is…presumptuous and almost blasphemous to turn the meaning of scripture around without due care, as though it were some game that we were playing. And yet many scholars have done this at one time” (61). Good exegetical procedure dictates that the details be viewed in light of the total context” (69). So the problem is not merely the common error of forgetting or disregarding the immediate context. It is, rather, the more serious error of attempting to atomize or fragment the text and then presuming that meaning can be attributed to phrases, sentences, or even paragraphs in isolation from the rest of the context” (70). The word context is composed of two Latin elements, con (‘together’) and textus (‘woven’). Hence when we speak of the context, we are talking about the connection of thought that runs through a passage, those links that weave it into one piece” (71). The exegete must feel that his primary obligation is to find this thread of thought which runs like a life stream through the smaller and larger parts of every passage. When this connection is missed or avoided, there is a fair chance that the interpreter may miss the scope, end, purpose, and entire plan by which the author ordered the various parts of his work. Thus the study of scope and plan belong to the study of a work’s context” (71). Once the exegete has determined the natural divisions and the literary type(s) of the individual book, it is time to get down to examining the passage that has been selected for exegeting. Usually this will be a periscope, or the like, consisting of one, two, or three paragraphs. It becomes evident that at this point the unit of concern must be the paragraph” (95). How shall we define and delimit the paragraph? Most of the criteria resemble those for marking off a section (see ‘Sectional Context’ in the previous chapter). The list includes the following: 1. The principle feature of a paragraph is a unifying theme. This is often indicated by the repeated use of the same term or concepts (‘love’ in 1 Cor. 13; ‘wisdom’ in 1 Cor. 2:6ff). 2. Rhetorical questions will often introduce a new paragraph (cf. Rom. 6:1). 3. A vocative form of address may commence a new paragraph (e.g., Col. 3:18—4:1). 4. Sudden changes in the text are one of the best ways to detect the beginning of a paragraph. For example, there may be an abrupt shift in the key actor or participant; the mood, tense, or voice of the verb; the location of the action; or the topic. The use of a striking introductory connective, be it a conjunction, preposition, or a relative pronoun, can also be an indicator. 5. Frequently what appears at or near the end of one paragraph is taken up and developed more fully in the next paragraph (e.g., ‘wisdom’ in 1 Cor. 2:5 and 6ff. )” (96). ‘Block diagramming’ must be sharply distinguished from ‘line diagramming.’ A line diagram is what many of us drew in our junior-high English classes. Each sentence was analyzed by itself and basically formed a one-line diagram. The purpose was to aid the student in identifying the parts of speech and the grammatical function of each word in the sentence. A block diagram is much different. It attempts to analyze all the sentences in a paragraph and to put them into a graphic design so as to show how they function together as a paragraph and how the arrangement of that paragraph compares with the arrangement of related paragraphs” (100). A block diagram arranges all the material, regardless of its length, so that the interrelationships of the whole sentences, clauses, and phrases might be visually apparent at a glance. The advantages of block diagramming over line diagramming are: (1) it forces us to focus on the total flow and thread of meaning throughout the whole paragraph rather than on isolated abstractions of individual words or phrases; and (2) it offers invaluable preparatory assistance for preaching and teaching because we can immediately see what is nuclear in the paragraph (the theme proposition) and what is subordinate” (100).